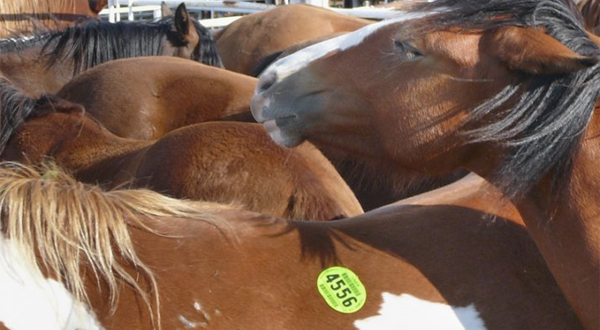 Just because there is a market for horse meat does not mean the U.S. must be a supplier. Sue Wallis and Unified Equine continue to work to return horse slaughter to U.S. soil, seeking permits in New Mexico and Missouri. Also in the article are statements by Horse Slaughter Sue’s colleague Dave Duquette saying both plants in New Mexico and Missouri are “ready to go”. Oh, really? Fact check please. Duquette also says people are wondering why the application process is so slow. Reality check please. There is always a “bill” out there somewhere. Which lobbying outfit do you work for “bill”? Are you getting paid by the comment or the time sitting at your computer? People like you are paid to “try” and convince sane people that horse meat is soooooo good for them. Sorry, it’ wont work so why don’t you slither back under the rock you slithered out from under. I don’t see how anyone would want to invest in a slaughter plant with the Moran Amendment handing over their heads, not to mention what will happen on July 31, 2013. Besides that, the HSUS is going to court the moment any request is approved to force the USDA to do a proper environmental investigation AND set up a passport system. This could be in court for years. I just can’t see anyone sinking money into this the way things are. Especially considering Dumm Duquett’s idiotic comment. Donna ….so you are saying the brave men and women that fought and died in WW2 were not civilized??? Since the US had a shortage of Beef during WW2 we fed our troops horse meat…… Get a flippin life. Horse meat is the best protein source their is…do your research. As for the USA it was served in the Harvard Club in NYC up til the mid 90’s….. Whether or not horse meat is a good source of protein is irrelevant to the issue or if they eat in the Harvard Club or on the lawns of Harvard University. Cat and dog meat is a good source of protein as well. Not that Donna needs me to defend her comment, but I believe what she is referring to is that horses are considered by the majority of people as companion animals, and not food animals. People do not eat their friends. Well maybe your sort does. Can’t speak for all, right? Be careful when you reply. I am the Editor. Thank you Virginia and I stand by my comment “bill”. And sounds like the “Harvard Club” in NYC finally came to their senses in the mid 90’s. Good for them. When will you come to your’s “bill”? Oh crap, not again…..CIVILIZED PEOPLE DO NOT EAT HORSE MEAT. Please put a stop to these slaughter plants PERMANENTLY…. No where in the USA ! horses are not for eating !